In this post, I’d like to introduce you to the current rules for operating drones in the UK. In the UK, a registration requirement for drones with a take-off weight of 250 grams is currently being planned. Registration will be possible online from October 2019 at the earliest. Registration is required from November 30, 2019. After registration, you will be assigned an identification number, which you must attach to your copter with a drone badge. Along with the registration requirement, it will also be necessary to demonstrate basic knowledge of UK law. Further details should be announced by October 2019. Unaffected by this, the following rules apply. Maximum flight altitude: The vertical flight limit is 120 meters in the United Kingdom. Maximum horizontal distance and FPV: Drones have to be always in the direct line of sight in the UK. The maximum allowed horizontal range is 500 meters. Compulsory insurance: To my knowledge, only commercial drones must have personal liability insurance. However, I recommend that everyone make drone insurance valid in the UK! Distance to airports: For the outer boundary of airports, a safety distance of one kilometer is to be maintained. On the island of Jersey, you have to keep a distance of at least 2 kilometers. Other safe distances: A distance of 50 meters between your copter and individual persons and buildings must be observed. A distance of 150 meters has to be ensured to gatherings of people and built-up areas (settlements). Flight bans: Areas with a flying ban can be identified with the Drone Assist app. Time of operations: Drone flights at night require separate permission. Regulations for commercial pilots: A permission must be applied for commercial activities. There is a form for foreign pilots (SRG 1320). 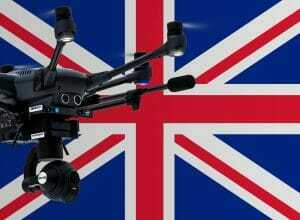 We have researched the listed drone regulations for Great Britain to the best of our knowledge. We can not guarantee the correctness of the information. If you want to be on the safe side, please contact the competent aviation authority. Alternatively, you can also ask the embassy in your country for further information about the regulations. Please leave us a comment when you receive news and/or gain experience with your copter in Great Britain!